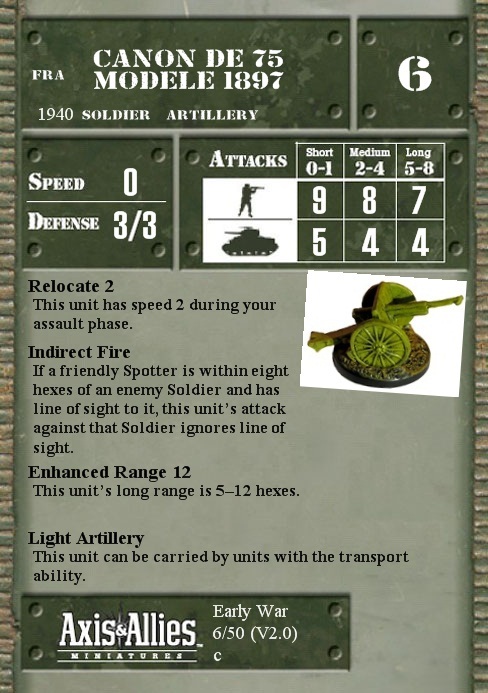 If a friendly Spotter is within eight hexes of an enemy Soldier and has line of sight to it, this unit’s attack against that Soldier ignores line of sight. This unit’s long range is 5–12 hexes. This unit can be carried by units with the transport ability. Q: Does Indirect Fire hit the front or rear defense when attacking a target? What if a spotter is looking at a target's rear, but the unit with Indirect Fire is in the front arc? A: Whether you hit the front or rear of a target depends on the facing of the target to the unit with the Indirect Fire SA. A spotter doesn't change this. It only allows that unit to ignore line of sight. Q: Can a US Jeep with the Transport SA tow a Quad 50? A: Yes, because the Quad 50 has the Light Artillery SA which allows any Vehicle with the Transport SA to carry it.